Physicals (dated on or after April 15, 2018) must be on file in order to practice/participate! If your student-athlete makes a team, there is a $50 pay-to-play fee that must be paid prior to the first competition. We are always in need of volunteers to help with sporting events. If you are interested and would like to help please email Ashley Stelter at astelter@wellspringprep.com, thank you! ​Click here for a physical form. Congrats to our girls varsity basketball team who made All-State Academic Honorable Mention this season! Congratulations and good luck to Preston Schuur on qualifying for Individuals at States! 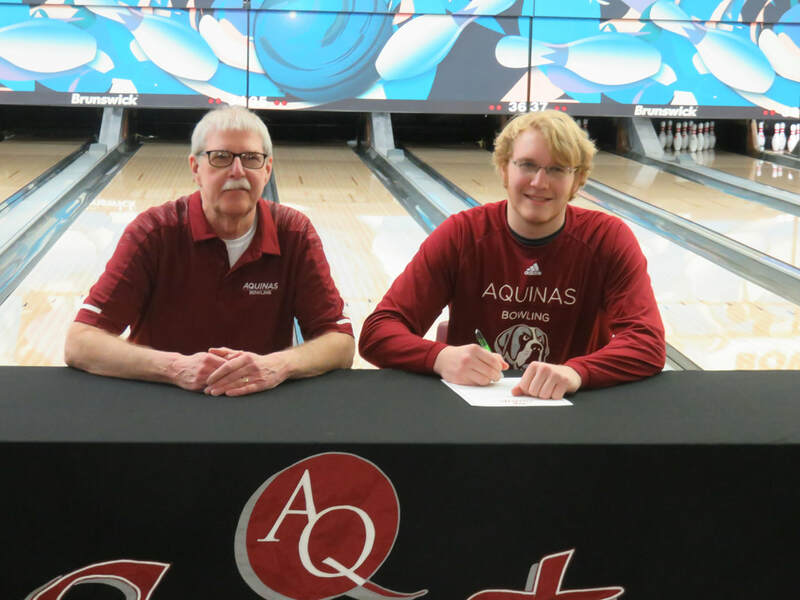 Congratulations to John Van Til on his amazing accomplishment to continue his bowling career at Aquinas College next year! Way to go, John! What a great turnout from our previous Wolves! The "old" guys from 2014-2016 beat the young guys from 2017 & 2018 in a close game! GO WOLVES! Five students representing multiple sport teams at Wellspring attended the MHSAA Sportsmanship Summit on November 12. This summit for high school student athletes provided breakout topics on sportsmanship and team leadership, interaction with sport officials, and the opportunity to connect with other student athletes from thirty different schools in the area. Our Volleyball Program decorated several hundred bags for Kid's Food Basket. They are an organization that nourishes children living at or near the poverty level with critical evening meals to level the playing field for their academic achievement. They ask for brown paper bags to be decorated so that the kids receive a happy, cheerful bag! Way to give back, Wolves! Congratulations to the Wellspring Varsity Volleyball team on their first place finish in the Alliance League Tournament. Congratulations to our Varsity Volleyball Lady Wolves in bringing home the first place trophy at the Godwin Pink Out Tournament! Congratulations to Wellspring's Cross Country Team on their programs first 1st place finish. Congratulations to the Lady Wolves Volleyball program for help raising $160 to towards breast cancer awareness and research. Congratulations to the Wellspring Prep's Girls Track and Field team for being being placed #1 in the Nation for overall team improvement. The track and field team is headed by Kolin Stickney with assistant coaches James Stickney and Seth Pronger. Congratulations on an amazing season and accomplishment! Congratulations to the Boys Bowling team on placing 3rd at Regionals and qualifying for States! The State Tournament is March 2-3 at Northway Lanes in Muskegon. Go Wolves! Congratulations to Thomas Shearer and Morgan Sullivan who were honored as the Meijer Scholar Athlete of the Week! Please follow the links to read more about their accomplishments here at Wellspring.